Yuling Designs is honored to have a variation of our Lincoln Stationery Collection showcased in the spring 2017 issue of Martha Stewart Weddings magazine. 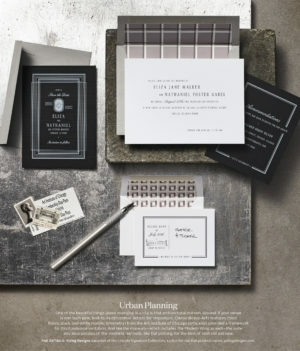 The editors challenged five designers to envision stationery suites that capture the essence of different signature locales and venues. This particular monochromatic color scheme was inspired by the Art Institute of Chicago. The polished wedding venue features Beaux-Arts styled architecture, checkered tiled floors, and black and white marble. Design details, linear borders, and jazzy typography arrangements make this handsome suite a perfect fit for an urban wedding, though the collection is well suited for any brides or grooms hoping to make a striking first impression with their wedding guests.